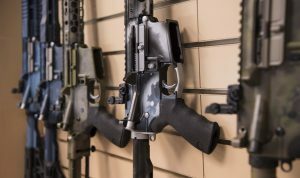 Why the ban on assault rifles was allowed to lapse in 2004? Why is the CDC is forbidden from researching gun violence? Shouldn’t second amendment advocates be willing to tolerate some infringement to keep school kids safe? Is teaching kids to run and hide or arming teachers really what we should do and not restrict guns? Focusing only on mental health/reporting strategies is not enough. the standard round fired by an ar-15 is .223, and is considered a medium-powered rifle round. Most hunting rifles fire more powerful rounds than .223, though they're typically not semi-automatic.